The Oracle of Omaha clearly sees value in the financial sector. We recently got a look at Berkshire Hathaway's (NYSE:BRK-A) (NYSE:BRK-B) closely watched stock portfolio, and it turns out that Warren Buffett and his stock-picking team had a fairly active second quarter. One of the most significant changes was that three of Berkshire's bank stock positions significantly increased during the quarter, with the company investing about $1.2 billion altogether. Here's a rundown of Berkshire's latest bank stock investments, why Buffett may have loaded up on these banks, and whether there could be more buying yet to come. Data source: Berkshire Hathaway SEC filings. Market value as of 8/15/18. While these aren't quite as large as Berkshire's investments in Wells Fargo or Bank of America, they still represent a significant portion of the portfolio. As of this writing, U.S. Bancorp is the seventh-largest position in Berkshire's portfolio, and Bank of New York Mellon and Goldman Sachs are 10th and 12th, respectively. Why is Buffett loading up on bank stocks now? Bank stocks make up more than $71 billion of Berkshire's stock portfolio, so it's fair to say that Warren Buffett is a big fan of the banking industry as a long-term investment. And if you're familiar with Buffett's investment style, it makes sense. Banks are a "forever" business, they use low-cost capital (customer deposits) to generate returns, and as a group, they tend to trade at relatively low valuations compared with other sectors. As far as why Buffett and his stock-picking team spent over $1.2 billion on bank stocks during the second quarter, I'd have to say it was Buffett doing what he does best -- bargain hunting. While we don't know for sure why Buffett (or one of his stock-pickers) made these investments, it could have something to do with the relatively poor performance of the financial sector. 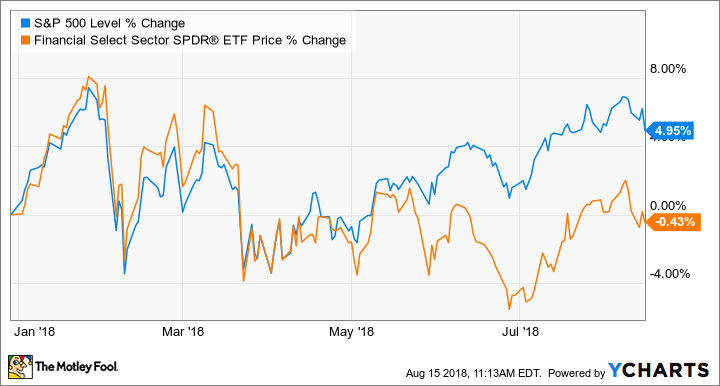 Bank stocks have underperformed the S&P 500 so far in 2018 by more than five percentage points, and there were times during the second quarter where the difference was even more pronounced. As I said in the last section, we don't know with absolute certainty why Buffett made any of his recent investments. Having said that, we can make some educated guesses. U.S. Bancorp is simply one of the best-run banks in the nation. It consistently delivers stronger returns on equity and assets than the rest of the big U.S. banks. Because of its tremendously high quality, U.S. Bancorp trades at a higher valuation than its peers, and rightly so. However, the bank's stock has performed even worse than the overall banking sector so far in 2018, and Buffett may have decided to pick up some shares on sale. Bank of New York Mellon is the oldest continuously operating bank in the U.S., and has a diverse revenue stream featuring private banking, asset management, and institutional banking businesses. Berkshire has added to its stakes in U.S. Bancorp and Bank of New York Mellon several times recently, including in the first quarter of the year, so I'm not shocked to see the positions continue to increase. Goldman Sachs first became part of Berkshire's portfolio thanks to a savvy financial-crisis-era deal by Buffett. The original investment was in the form of preferred stock with warrants, which were eventually exchanged for 43.5 million common shares. Berkshire sold most of these in the years since, as you can see in the chart at the top of the page. However, it looks like Buffett and company think that Goldman might have gotten cheap again. I couldn't agree more, and I've written before that Goldman looks like a compelling value at the current price. Goldman has been one of the worst performers in the sector, down nearly 10% so far in 2018 despite rather strong results and a rapidly growing consumer banking segment. In fact, I wouldn't be surprised if Buffett buys even more if the price stays rather low. Will Buffett keep adding to Berkshire's bank stocks? Goldman Sachs remains a compelling value, so if I were making investment decisions for Berkshire, that's the one I'd be aggressively adding. Synchrony Financial (NYSE:SYF) is another Berkshire bank stock trading at a big discount after just losing its Walmart partnership, and as Berkshire's smallest current bank position, I wouldn't be surprised if Buffett decided to double down. The bottom line is that there are some compelling values in the banking industry, and during the second quarter, Buffett and his team did what they do best -- put money into excellent companies trading at fair prices.